Does anyone remember what banking was like in Nigeria before the era of cashless transactions? I remember having to queue inside the bank just to withdraw ₦1,000. Just shows how far we have come. Nowadays, banking is much easier with a variety of payment channels: credit/debit cards, mobile banking and internet banking. Card payments in particular can be quite instrumental in saving time otherwise wasted with cash withdrawals, and those used in Nigeria are almost always debit cards. A debit card allows you to spend only what you have in your bank account. A person with ₦12,000 to his/her name can only spend ₦11,000 on their debit card, assuming their bank has a minimum balance requirement of ₦1,000. If a withdrawal above ₦11,000 is attempted, the automated teller machine (ATM) reminds the withdrawer that there is insufficient balance available. So what is a credit card and how is it different from a debit card? A credit card gives you access to credit from your bank. Think of it as a friend that lends you money when you need it with the promise you’ll pay back later. Though he’s a generous friend, there’s a ‘credit limit’ he can’t exceed (i.e. he can’t give beyond that amount). After a month, your friend reminds you of what you owe and you pay back in full. If you’re unable to do so, he might give you the option of paying in bits plus interest. Here’s a short video explaining difference between both cards. In the case of credit cards, your lender is the bank. The bank gives you a line of credit (an amount of money) to use. You can withdraw a part of this credit as cash, use for online transactions or at POS terminals. At the end of the month, your bank sends you a statement detailing what you’ve spent, what remains, other charges/interest and your minimum monthly repayment. You are expected to pay at least the minimum monthly repayment on your card. 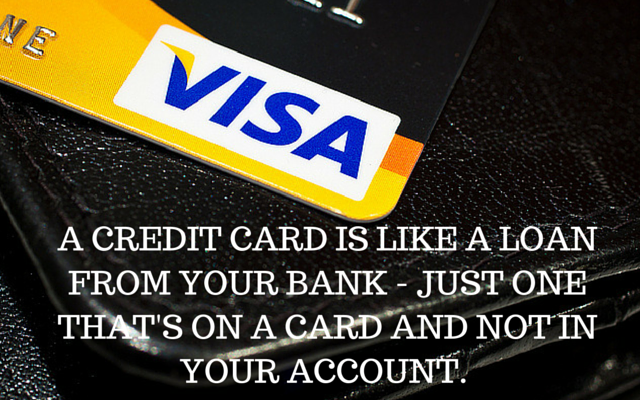 From the above, it is obvious the main difference between debit and credit cards. The former allows you use only money you own, with the latter you borrow to pay later. Interest on credit cards mostly come when you don’t repay in full. It is charged to the outstanding balance after payments and added to the following months’. Therefore the higher your outstanding balance, the more interest money you’ll pay in the long run. Also, from survey, some banks charge interest on cash withdrawals only. Others might charge for every form of transaction. All the banks we checked promise no interest when you pay 100% of what you’ve used on your card. This is bar interest on cash withdrawals. What do I need to get a credit card? To get a credit card you have to meet certain requirements. For starters, you have to be gainfully employed or have a steady income source. Hence, you will be expected to provide evidence of employment/business. Banks often put salary expectations for customers to be eligible for different credit card products. For example, the least salary to be eligible for a credit card is N80,000 for some banks. Some banks might require you to have an account with them. This could be for ease of repayment. Other requirements are a valid ID, passport photographs, proof of place of residence (electricity bills), and completed credit card application form. How can I apply for a credit card in Nigeria? Virtually all Nigerian banks offer credit cards. These cards might be denominated in Naira and/or Dollar with some even PayPal verified. The process is relatively easy and can be started from the comfort of your living room for some cases. First bank provides an eligibility assessment tool to check for their card product one is eligible for. From using the tool, we learnt that customers need to have a bank account with First bank to qualify for a First Naira credit card. Contact information provided in the tool can be used to follow up on the application process. Application forms can be gotten at the nearest First bank branch. Access banks offers Naira/Dollar dual-denominated credit cards from Visa. To get it you will need to visit the nearest Access bank branch. After card collection from bank branch, cardholder authentication and card activation will be done by calling contact centre on 012712005-7. For more enquiries email contactcenter@accessbankplc.com. Zenith offers both Visa and MasterCard credit cards. Application for these cards can be done by walking into any branch. You can also send an email to cardservices@zenithbank.com or zenithdirect@zenithbank.com. Calls can be made to 012787000, 012927000, 014647000, and 0700ZENITHBANK. I in addition to my guys were actually reading through the excellent things located on the blog and so immediately came up with a horrible suspicion I never thanked you for those strategies. My people are already as a result warmed to read through all of them and have without a doubt been tapping into those things. I appreciate you for turning out to be really helpful and also for considering this kind of great resources most people are really eager to learn about. My very own honest apologies for not expressing appreciation to earlier. I wish to show my gratitude for your kindness in support of people that must have help on your question. Your personal commitment to passing the solution across appeared to be unbelievably valuable and has continuously made workers like me to arrive at their dreams. Your own helpful advice signifies much a person like me and a whole lot more to my office workers. Best wishes; from each one of us. I wanted to create you the very small observation to finally give thanks yet again with the fantastic tactics you have featured at this time. It’s really extremely open-handed with people like you in giving publicly all a lot of folks could possibly have supplied for an electronic book to help make some bucks for themselves, primarily now that you might have done it if you ever desired. The techniques in addition worked to be a easy way to fully grasp other individuals have similar fervor really like mine to figure out more related to this issue. I believe there are a lot more pleasurable situations in the future for people who start reading your blog. I have to point out my admiration for your kind-heartedness for women who require help with in this study. Your special commitment to getting the message around ended up being extraordinarily advantageous and has without exception enabled folks like me to reach their objectives. Your own warm and helpful help means so much a person like me and even further to my mates. Best wishes; from all of us.